The 19th edition of CHINA MINING Congress and Expo ( CHINA MINING 2017), co-hosted by the Ministry of Land and Resources of China, Tianjin Municipal People's Government and the China Mining Association, was held at Tianjin Meijiang Convention & Exhibition Center on September 23th to 25th, 2017. Rising project team was invited to join. 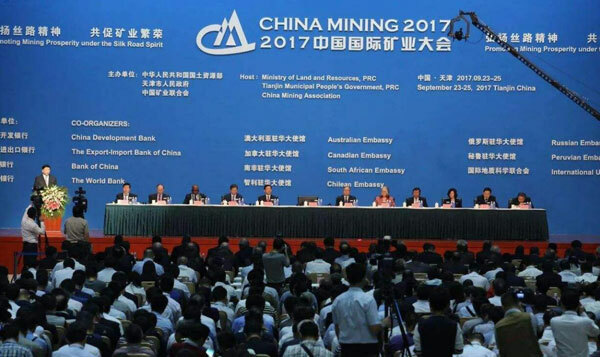 Government officials, experts and scholars of mining enterprises and financial institutions from 54 countries and regions, with a total number of 8,000 delegates attended China Mining. More than 500 exhibitors came to Tianjin home and aboard. International Cooperation Department of Rising Investment was invited to join, and negotiate with international exhibitors. This year's event focused on how to encourage further development of China's mining sector and how that sector can support the One Belt, One Road initiative, adhering to the principle of “innovation, coordination, green open, sharing”. "Over the past year, China's Geological Exploration invested more than 770 billion yuan. Two hundred million tons oil fields, two hundred billion cubic meters gas fields, and one 10million lead-zinc ore were newly established”, said Jiang Daming, minister of Land and Resource and chairman of China Mining 2017 committee on the opening ceremony. Chinese mining products began to improve, and the mining overall profit increased 12.4times year on year. Rising project team participated the exhibition in which Government officials from 17 countries worldwide, including Argentina, Australia, Canada, Greenland, Mexico, Morocco, Nigeria, Peru, South Africa and Sudan, have their delegation presented. The Rising Project team had small talks with delegations, exchanged opinions with potential cooperators, and paved way for future cooperation.